Anyone used anything in this package b4? I've been thinking of using it, but i heard the hats were terrible. Im not spending over $700 for a package with bad hats. Also-anyone know anything of the fast crash? All advice and tips are appreciated and make sure you yell at me if i'm asking stupid questions. I've played the 20" Ride and the 16" Crash before, and let me tell you, those things just sang! They almost made me switch to A Customs. I played them at a big boozefest party once (yeah, I'm 14, that was hilarious) and they were amazing. I was very tempted to steal them (and the dude's vintage Slingerland Snare). The hats arent bad. I like mine. 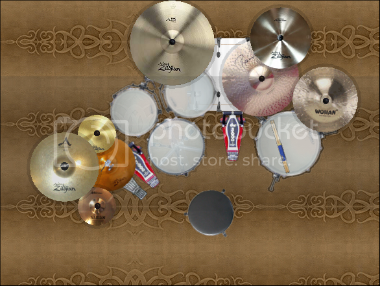 I played every cymbal that comes with that package including the hats and they all sound terrific. In my opinion Zildjian A Customs are some of the best cymbals you can buy and they fit into many musical genres. All the cymbals on my Tama Bubinga kit are A Customs. I use A custom's and they rock. You pretty much can't go wrong with them IMO. Fast crash is basically a thin cymbal. They're really nice, but it'll be kind of hard to make it loud. Why not trying them out first? If you like it, get it, but I still recommend you to pick your own cymbals. I own the Ride and it is AMAZING. It's not too pingy but it carries a very good stick definition and it's also a very good large crash which is what I use it for most of the time. My friend owns the crash and it sounds great too. nice bright cutting sound. I've only tried the hats in some music stores and they seem okay but not really my taste. they feel too light for me. I probably own every cymbal in the Zildjian A Custom pack and then some. They are some of the most versatile cymbals I ever played. audiotech wrote: I probably own every cymbal in the Zildjian A Custom pack and then some. They are some of the most versatile cymbals I ever played. Dual rides nice! I have a similar setup when I can be assed with setting it up! I have the 16" sounds great, 20" Medium ride, sounds great, 14" A Customs mastersound hats, sound great. They're good pies! damn thats nice! Thanks for the advice! sorry to head off subject but I have a friend with those TAMAs and they are awesome. very beautiful. and I noticed another kit in the corner! Holy Crap! A customs are the way to go man, and whoever stated that the hi-hats sound bad, i wouldn't take to much advice from that person. The 20" ride in that pack makes a great crash/ride i actually used that as another one of my crash cymbals and bought another ride cymbal.